Application can be a bit tricky. This blush tends to fade somewhat, but I have used it long enough to enjoy touch-ups. The shades are worth the practicing in applying, from luscious "Pink Frosting" to "Rose Petal" and "Candy Coral." I have always been a loyal fan of powder blush. Sometimes I would consider trying a cream blush or one of those all-in-one type products, but eventually I would talk myself out of it. I was in Target the other day and I decided I wanted to finally get a cream blush. I wanted something I could apply with my fingers, mostly so I could downsize my makeup bag for travel. I have a trip coming up during...read more which I know I won't wear much makeup, but I will want to have some key items with me for those occasions when I do want to have some makeup on. I was in a bit of a rush, so maybe I missed something, but it appeared that this blush was the only one my Target had in stock that was not a powder. From ANY brand. So this is the one I purchased. The colors all looked frighteningly bright to me in the store, but I finally settled on the Pink Plum shade. I was definitely intrigued by this "bouncy" concept and the fact that it says it's a cream/powder type product. I LOVE this blush. I still prefer powder for being quick & easy, but this product is exactly what I wanted for travel. It is easy to apply with my fingers--I just tap and/or gently rub (very gently as this product does have a bit of squish to it) on the product then tap and blend onto my cheeks--so I won't have to pack my blush brush. What looks like a scary bright color in the compact blends nicely into a sheer, natural flush that is buildable if I want a little more color and perfectly flattering on my fair skin. I noticed several reviews indicating this might fade throughout the day, so I kept an eye on it all day yesterday and had no issues with fading at all. I wear it over Aveeno BB cream, then dusted with Guerlain Meteorites, so maybe that combination gives it more staying power? I'm not sure--on the trip I'll be wearing it only with the BB cream, as the meteorites are not so much designed to travel well, so we'll see if that makes a difference I guess. Like I said, I still prefer powder blush for every day, though I may grab this from time to time as it is fun...but this is PERFECT for travel and probably will be the only blush I bring on trips from now on. I only need a tiny amount to get the color I like, so I think that tiny (again, ideal for travel!) compact is going to last a nice, long time. There were so many bad reviews on this but it was either between this or the Loreal Colorlift blush which costed an extra $5 more. The colors are nice and not as pigmented but it gives off a more natural flush, something I'm hoping we all want instead of that heavy blush look. I don't want to end up looking like my cheeks were burned. 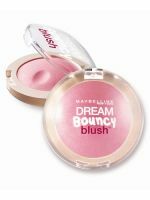 The texture didn't bother me one bit and I like how it goes on ...read morecreamy and smooth when you apply it and then dries to a powder perfection but the only thing I didn't like so much is that this blush didn't melt into my skin. It ends up looking cakey and clings to dry patches on my cheeks. My friends found this blush really interesting. They seem to like it too, the whole concept of it all. They're used to the powder blushes but after the powder keeps breaking apart in their purse (kind of like my scenario), they're converting to this. The colors for this are very sheer and they don't seem to last long. I had this on at 8 in the morning and by 10 or 11, the color was already gone so I had to keep reapplying.